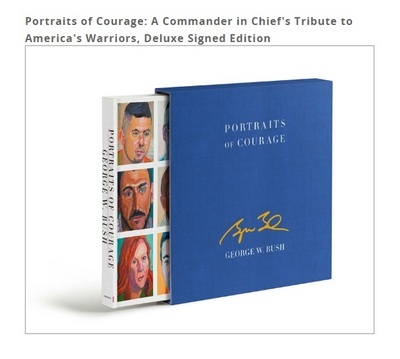 A deluxe, signed edition of President George W. Bushs collection of oil paintings and stories honoring the sacrifice and courage of Americas military veterans. Due to high sales volume, please allow 2 to 3 business days to process delivery. With Forewords by former First Lady Laura Bush & General Peter Pace, 16th Chairman of the Joint Chiefs of Staff. Growing out of President Bushs own outreach and the ongoing work of the George W. Bush Institutes Military Service Initiative, this book brings together 66 full color portraits and a 4 panel mural painted by President Bush of members of the United States military who have served our nation with honor since Sept. 11 and whom he has come to know personally. The authors profits from this book will be donated to the George W. Bush Presidential Center, a non profit organization whose Military Service Initiative is focused on helping post September 11 veterans and their families make a successful transition to civilian life.